UFC 223 popped off tonight (Saturday, April 7, 2018) from the Barclays Center in Brooklyn, New York. The night was headlined by a championship doubleheader. 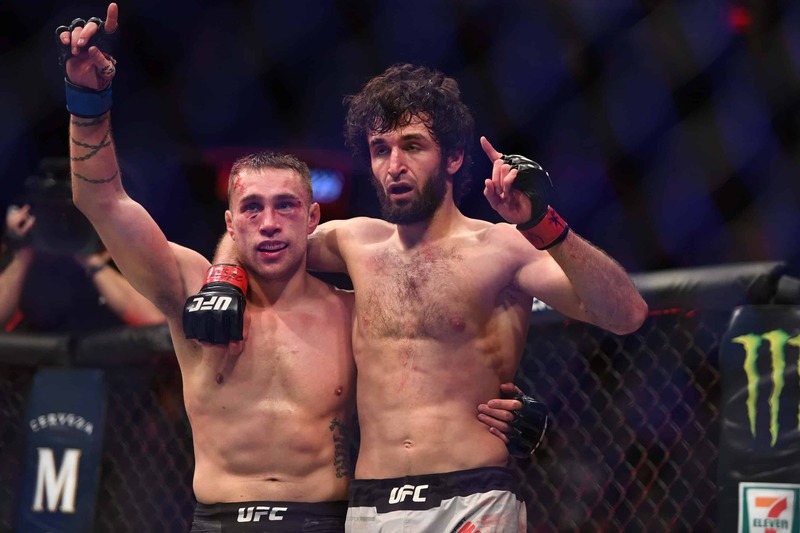 Khabib Nurmagomedov and Al Iaquinta battled for the lightweight strap, and Rose Namajunas and Joanna Jedrzejczyk rematched for the strawweight title. Namajunas retained her title and Nurmagomedov won his, but neither won a post-fight bonus. The Fight of the Night came from an unexpected source. 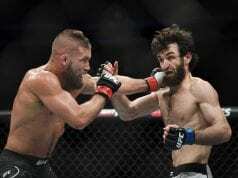 The biggest mismatch of the evening according to Vegas, the featherweight battle between Zabit Magomedsharipov and Kyle Bochniak turned out to be an entertaining slugfest. 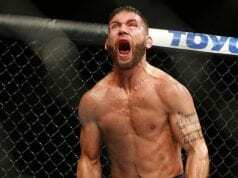 “Crash” Bochniak refused to go quietly against the blue-chip Dagestani. The outgunned and undersized Bochniak aggressively pressured and threw haymakers early and often. On several occasions, he dropped his hands and walked forward with his tongue out, despite being covered in blood and behind on the scorecards. The dynamic Magomedsharipov bashed the New Englander with kicks, left hooks, and spinning attacks, but Bochniak wouldn’t quit. He had a fading Zabit on the cage in the final seconds, and the two 145ers played Rock ’em, Sock ’em Robots until the final bell. Fans awarded the pair with a standing ovation, and UFC officials awarded them an extra $50,000. The Performances of the Night went to the only two finishes on the card. On the prelims, Olivier Aubin-Mercier picked up the most impressive win of his career, taking out the ultra-durable Evan Dunham in less than a minute. Knees to the body were the Canadian’s weapon of choice. He folded Dunham with one to the solar plexus, a second one dropped him to all fours, and follow-up punches ended the fight. Aubin-Mercier walks away with an extra $50,000 for his efforts. The second Performance of the Night went to Chris Gruetzemacher for the two-round beatdown he put on fan-favorite Joe Lauzon. “Gritz” weathered Lauzon’s customary early barrage and started to take over before the first round even ended. Lauzon began to fade after his power punches and takedown attempts failed to yield the desired results. Gruetzemacher steadily got rolling, beating up Lauzon to the head and body in an increasingly one-sided fight. By the end of the second, Lauzon had very little left in the tank, his face badly swollen and bloody. His corner waved it off between rounds, giving Gruetzemacher a much-needed win and an extra $50,000. Keep it locked to LowKickMMA for all your UFC 223 post-fight news, notes, and analysis.